Fractions are a portion of something. 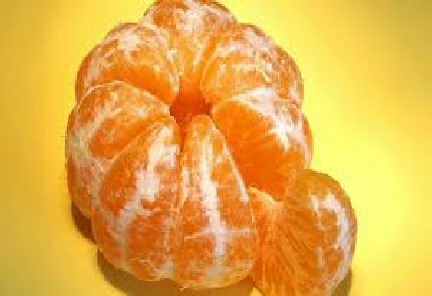 If we peel an orange it has 8 slices. Each slice is a fractional proportion of the whole orange. Each equal slice is 1/8th (1 divided by 8) of the orange or one of eight slices. A fraction is something smaller than a whole. In math they represent division. A piece of cake, slice of pie or pizza are each a portion of something larger. Solving fractions we sometimes use addition, subtraction and multiplication. M is divided by N. M is the numerator. N is the denominator. For now M and N will be integers. A denominator cannot equal zero. Slice of the orange is one of eight equal portions. Equivalent fractions are two or more fractions that look different from each other, but are the same value. They are sometimes called like fractions or stated as equivalent ratios. 32/64 = 16/32 = 8/16 = 4/8 = 2/4 = 1/2 is something divided into 2 equal portions. 16/64 = 8/32 = 4/16 = 2/8 = 1/4 is something divided into 4 equal portions. 8/64 = 4/32 = 2/16 = 1/8 is something divided into 8 equal portions. Each fraction is using a multiple of 2. Multiplying the numerator and denominator of a fraction by the same number is always an equivalent fraction. Dividing the numerator and denominator of a fraction by the same number is always an equivalent fraction and is for reducing fractions. The most efficient fraction reducer is when the greatest common divisor of the denominator is the numerator, the resulting numerator is always 1. 2/8 and 1/4 are equivalent, 1/8 is half the size of 1/4. 4/8 and 1/2 are equivalent, 1/8 is quarter the size of 1/2. 8/8 and 1 are equivalent, 1/8 is eighth the size of 1. 2/4 and 1/2 are equivalent, 1/4 is half the size of 1/2. 4/4 and 1 are equivalent, 1/4 is quarter the size of 1. 2/2 and 1 are equivalent, 1/2 is half the size of 1. Whenever possible we want to simplify fractions. It is reducing fractions to their simplest form. A lot of solving math problems is applying rules so that an answer or result of an operation is easiest to work with. When the numerator is smaller than the denominator we have a proper fraction. When the numerator is larger than the denominator we have an improper fraction that should be reduced to a mixed fraction. Mixed fractions are a combination of integers and fractions. 1 2/3 and 3 1/2 are mixed fractions. A fraction that is divided by a fraction is a complex fraction. Since fractions are math division they are often different quantities of ingredient portions that combine to form or create something, and can be stated as ratios and proportions. The ingredients that are used to bake a cake are each different quantities of different food items that are combined. Each ingredient can be stated as a ratio or proportion of the entire cake or of another cake ingredient. To solve complex fractions we rewrite the math problem to multiply the numerator fraction by the flipped over denominator fraction. Flipping a fraction over the numerator becomes the denominator and denominator becomes the numerator, the reciprocal of a fraction. Rewrite the fraction division as a multiplication problem. If the result is an improper fraction then reduce that fraction to obtain the answer. Explanation – You have 1/2. The 1/2 is 1/4, a fourth, of some number. The total is 2 because 4 halves equal 2.